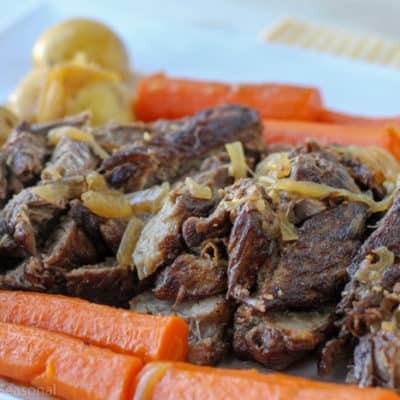 Crockpot Express Pot Roast is a classic meal cooked in a new way that cuts down on cook time and infuses the meat with so much flavor! 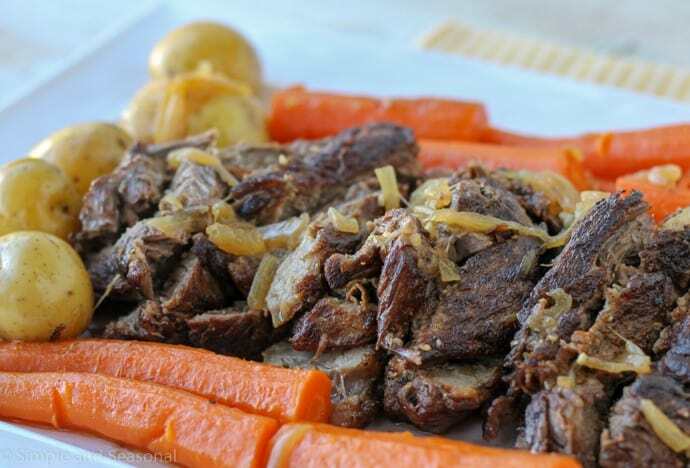 It seems like EVERYONE wants to make pot roast as one of their first meals after getting the Crockpot Express and often, they are disappointed with the results. If you want a good quality meal, it’s going to take a bit of preparation-no short cuts! 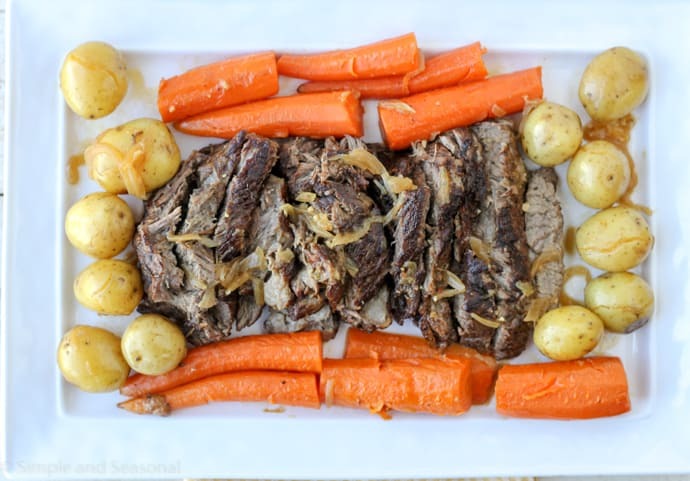 Trust me, the work is worth it when you dig in to a plate full of Crockpot Express Pot Roast! First, you need to understand the difference between various cuts of meat. 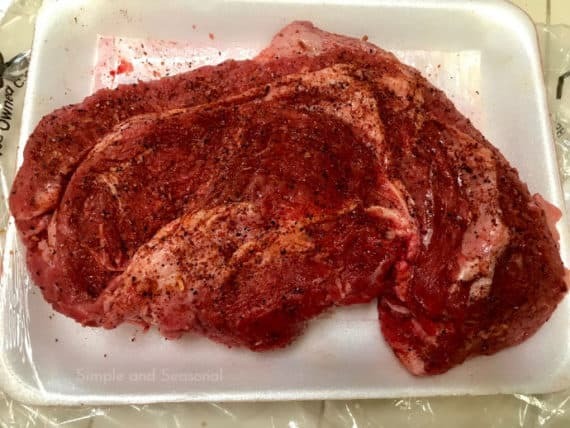 You can read more about what kind of cut is best for different cooking methods here: Beef, It’s What for Dinner. For a tender, flavorful pot roast, you need to get a good Chuck Roast. (Arm Chuck or Blade Chuck will work.) Make sure it’s at least 2″ thick and has lots of marbling. All that fat is going to melt down and infuse so much flavor into the beef! Second, be prepared to spend some time on the prep. 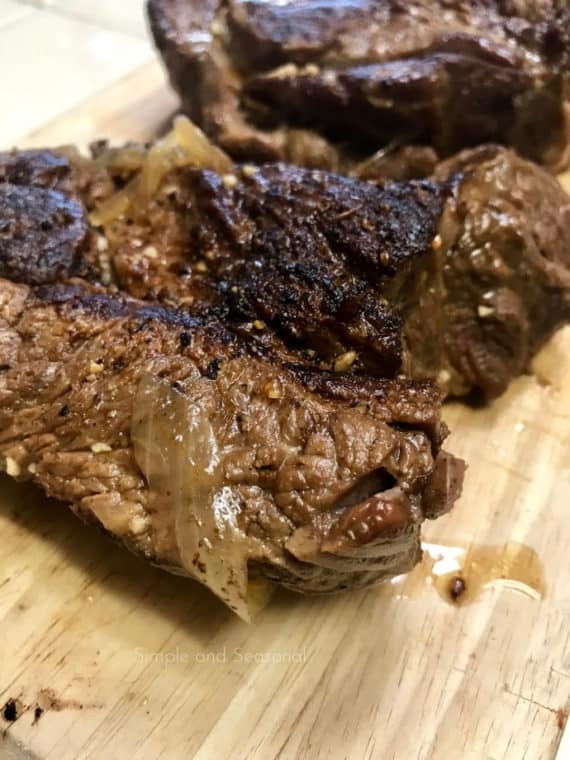 Yes, you can just toss the meat into the pot and hope for the best, but a few extra steps will take your pot roast from good to melt-in-your-mouth-AMAZING. If your roast is large, it will need to be cut in half to fit. That means a lot of searing time before the cook time starts. But trust me, it’s worth it. Seasoning, searing, flavorful broth, and resting time all work together for best results. 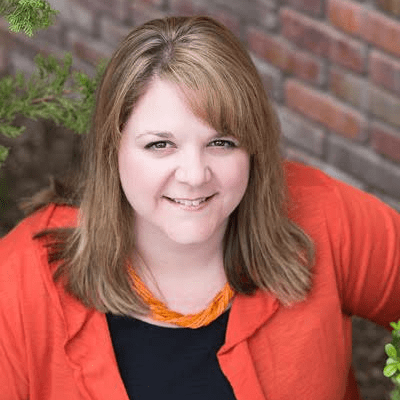 This recipes is definitely going on my page of favorite Crockpot Express Recipes! 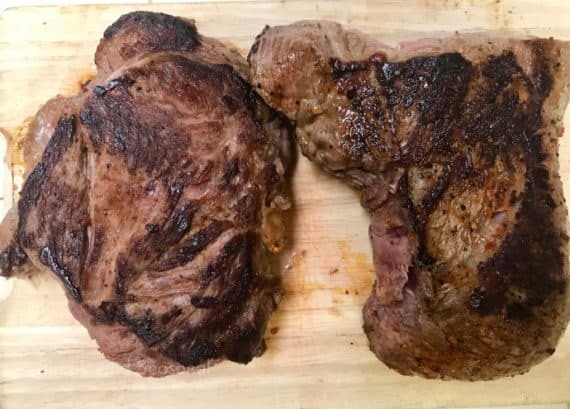 Cut the meat into two equal pieces. Once the pot is heated completely, add the oil and make sure it's spread around the bottom of the pot. Using silicone tipped tongs, place ONE of the pieces of the roast on the bottom of the pot. Do not move it. Allow to sear for 10 minutes on one side, then flip and sear for another 5-10 minutes. Remove the first chunk of meat and repeat the process with the second. After both of your pieces have been seared on both sides, remove them and let them rest while you prep the sauce. (Leave the CPE on Brown/Saute) Add the garlic and sliced onions to the pot and saute for a few minutes until soft. Then stir together the vegetable stock, beef bouillon cube and soy sauce until mixed well. Pour into the onion/garlic mixture and use it to "deglaze" the pot. Stir well, scraping up all those beautiful bits of beef left over from searing. Press Stop/Start to cancel the Brown/Saute mode. Place both chunks of seared meat back down into the sauce. Don't stack them on top of each other. They should fit side by side. Close the lid, lock it, and set the Steam Release Valve to closed. Press Meat and adjust time to 45 minutes. When the cooking cycle ends, allow for a full natural pressure release. (At least 25 minutes.) After the NPR, open the lid and remove the meat. DO NOT SLICE IT YET! Allow it to rest under a foil tent while you make the potatoes and carrots. Place the potatoes and carrots directly in the cooking juices. Put the lid back on, twist to lock and close the steam release valve. Press Steam and set for 5 minutes. After the cooking cycle is done, do a Quick Release remove from the pot. Slice roast. Cut against the grain to keep it tender. Place it on a serving dish and surround with carrots and potatoes. Drizzle with additional drippings or gravy. Cutting the meat into even pieces is very important. This will help with more even cooking and keep the pot from getting too crowded while searing the meat. It needs room to breath so you get a great sear on the outside. While searing, you may need to restart the Brown/Saute cycle if you reach the end of the 30 minute timer. Don't let it go to Keep Warm! Just press Start/Stop, then Brown/Saute again and start over. It won't take time to heat back up since it's already hot. Because the pot is already warm, it won't take long for it to come back to pressure after removing the meat and adding the vegetables. It should be ready in less than 5 minutes. Honestly, I’m not much of a red meat person, but this Crockpot Express Pot Roast didn’t last long on my plate! 🙂 I guess there’s a reason pot roast is such a classic comfort food! Be sure to pin this recipe to save it for later. Looking for a great bread recipe to go with it? 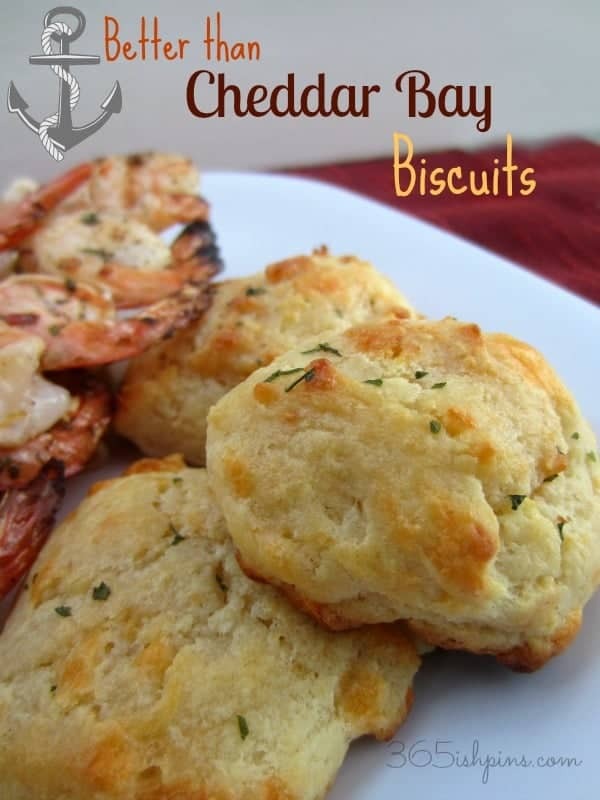 Try these Copycat Cheddar Bay Biscuits! Excellent!!! Easy CPE recipe and very delicious. Bet I’ve made at least 100 pot roasts in my lifetime, but none–not one–compares to this recipe! I think the long searing really made a difference, locking in the flavorful juices. The finished roast was fork tender. My husband, who hates chewy meat was less than excited when he heard pot roast was for dinner. Until he tasted this one, then exclaimed over and over, “This meat is like butter!” Thanks for this wonderful recipe, Nicole. I’m looking forward to making it again and again! You are so welcome! 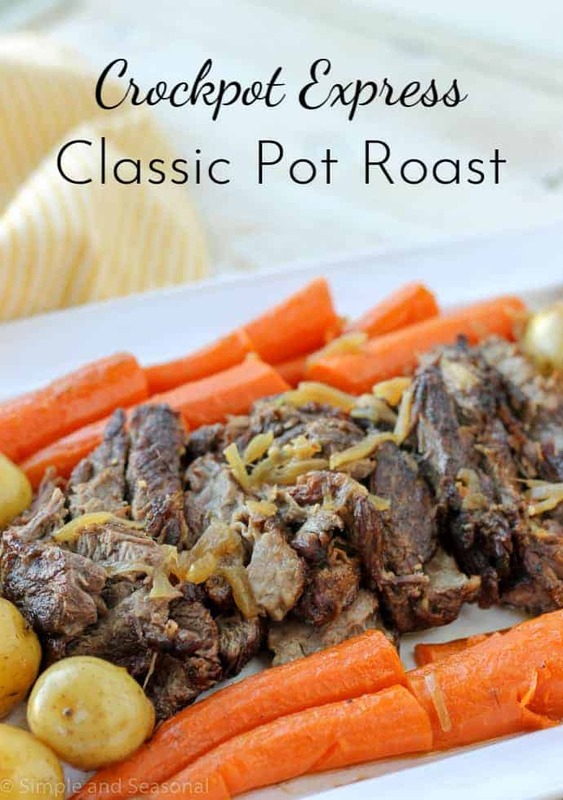 I’m not a huge fan of red meat/roasts, either, but this was such a hit with our family! This was delicious! My potatoes were a little bigger so I cut them in half and cooked them on the trivet with the carrots. I also made gravy out of the leftover liquid. Thanks for this recipe! Best pot roast we have had! Will never make roast another way again! !